blocks for bucks - Phillips Murrah P.C. What’s in a name? For Phillips Murrah, our name represents over 30 years of dedication and partnership with our clients and our community. We are proud to announce our new exterior sign, which proudly hangs on OKC’s Corporate Tower, wherein our headquarters is located. It’s no secret that Phillips Murrah has ramped up our effort to raise the profile of our Firm’s name and recognition of our logo, and our new Corporate Tower sign is a fine example of “pure branding.” However, it is important to also point out that “pure branding” has not been our recent promotional path. Over the years, our Firm, as well as our individual attorneys and staff, has been very active in the community through dedicating time, energy and funding to many causes and organizations throughout Oklahoma City. However, many of these efforts have flown under the radar regarding our position in the consciousness of the community. The fundamental motivation for these actions simply does not include praise or recognition. However, from a branding standpoint, it is important to tie our innate philanthropic spirit, both as individuals and as a corporation, into a larger campaign designed to share who Phillips Murrah is and what we do outside of providing excellent representation for our clients. This is why many of our recent promotional campaigns are concerted efforts to achieve two goals: One, to raise awareness of our brand in the community, and two, to ensure that each of these campaigns demonstrate our commitment to the community. For example, our partnership with the Oklahoma City Thunder, through our Blocks for Bucks campaign, directly benefits the Thunder Cares Foundation. 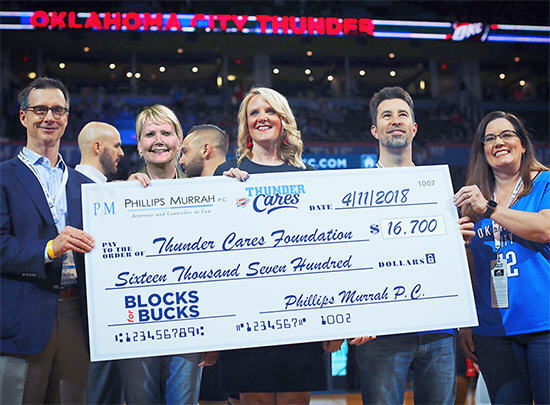 For each shot blocked by our home team during home games, Phillips Murrah donates $100 to Thunder Cares, which helps fund the great work they do in the community. For the 2017-2018 season, Phillips Murrah donated a total of $17,000 to Thunder Cares. We are happy to say that we’re on our way to exceed that amount for the 2018-2019 NBA season. Another example of this two-pronged strategy is our sponsorship of the Six Day Cellars tent at the 2018 Festival of the Arts. While helping provide a great area for leisure and refreshment to patrons of OKC’s annual art festival, we are also proud to help fund one of our city’s great non-profit organizations, Arts Council Oklahoma City. We are repeating our sponsorship of Six Day Cellars at the 2019 Festival of the Arts. Through these and other campaigns, including with the StoryCorps Mobile Recording Booth, Regional Food Bank of Oklahoma and Cristo Rey, Phillips Murrah goes beyond “pure branding” to ensure that those who become more aware of our Firm’s name through our promotional efforts also understand that, while we are committed to the success of our clients, we are also committed to helping build a better community.